For other uses, see Haarlem (disambiguation). Not to be confused with Harlem. listen), formerly referred to as Harlem in the English language) is a municipality and a city in the Netherlands. It is the capital of the province of North Holland, the northern half of Holland, which at one time was the most powerful of the seven provinces of the Dutch Republic. Haarlem lies in the northern part of the Randstad, one of the largest metropolitan areas in Europe. By the end of 2011 Haarlem had a total population of 151,853. The municipality of Haarlem also comprises part of the village of Spaarndam, a newer housing estate of this village forms part of the neighboring municipality of Haarlemmerliede en Spaarnwoude. Haarlem has a rich history dating back to pre-medieval times, as it lies on a thin strip of land above sea level known as the strandwal (beach ridge), which connects Leiden to Alkmaar. The people on this narrow strip of land struggled against the waters of the North Sea from the west, and the waters of the IJ and the Haarlem Lake from the east. Haarlem was able to become wealthy with toll revenues that it collected from ships and travellers moving on this busy North-South route. However, as shipping became increasingly important economically, the city of Amsterdam became the main Dutch city of North Holland during the Dutch Golden Age. The town of Halfweg became a suburb, and Haarlem became a quiet bedroom community, and for this reason, Haarlem still has many of its central medieval buildings intact. Today many of them are on the Dutch Heritage register known as Rijksmonuments. The list of Rijksmonuments in Haarlem gives an overview of these per neighborhood, with the majority in the old city center. The oldest mentioning of Haarlem dates from the 10th century. The name comes from "Haarlo-heim" or "Harulahem", which means 'place, on sand covered with trees, higher than the others'. There was a stream called "De Beek", dug from the peat grounds west of the river Spaarne as a drainage canal. Over the centuries the Beek was turned into an underground canal, as the city grew larger and the space was needed for construction. Over time it began to silt up and in the 19th century it was filled in. The location of the village was a good one: by the river Spaarne, and by a major road going south to north. By the 12th century it was a fortified town, and Haarlem became the residence of the Counts of Holland. In 1219 the knights of Haarlem were laurelled by Count Willem I, because they had conquered the Egyptian port of Damietta (or Damiate in Dutch, present-day Dimyat) in the 5th crusade. Haarlem received the right to bear the Count's sword and cross in its coat of arms. On 23 November 1245 Count Willem II granted Haarlem city rights. This implied a number of privileges, among which the right for the sheriff and magistrates to administer justice, instead of the Count. This allowed for a quicker and more efficient judiciary system, more suited to the needs of the growing city. After a siege from the surrounding area of Kennemerland in 1270 a defensive wall was built around the city. Most likely this was an earthen wall, with wooden gates. Originally the city started out between Spaarne, Oudegracht, Ridderstraat, Bakenessergracht and Naussaustraat. In the 14th century the city expanded, and the Burgwalbuurt, Bakenes and the area around the Oudegracht became part of the city. The old defenses proved not to be sufficiently strong for the expanded city, and at the end of the 14th century a 16½-metre high wall was built, complete with a 15-metre wide canal circling the city. In 1304 the Flemish threatened the city, but they were defeated by Witte van Haemstede at Manpad. All the city's buildings were made of wood, and fire was a great risk. In 1328 nearly the whole city burnt down. The Sint-Bavokerk was severely damaged, and rebuilding it would take more than 150 years. Again on 12 June 1347 there was a fire in the city. A third large fire, in 1351, destroyed many buildings including the Count's castle and the city hall. The Count did not need a castle in Haarlem because his castle in Den Haag had taken over all functions. The Count donated the ground to the city and later a new city hall was built there. The shape of the old city was square—this was inspired by the shape of ancient Jerusalem. After every fire the city was rebuilt quickly, an indication of the wealth of the city in those years. The Black Death came to the city in 1381. According to an estimate by a priest from Leiden the disease killed 5,000 people, about half the population at that time. In the 14th century Haarlem was a major city. It was the second largest city in historical Holland after Dordrecht and before Delft, Leiden, Amsterdam, Gouda and Rotterdam. In 1429 the city gained the right to collect tolls, including ships passing the city on the Spaarne river. At the end of the Middle Ages Haarlem was a flourishing city with a large textile industry, shipyards and beer breweries. Around 1428 the city was put under siege by the army of Jacqueline, Countess of Hainaut. Haarlem had taken side with the Cods in the Hook and Cod wars, and thus against Jacoba of Bavaria. The entire Haarlemmerhout wood was burnt down by the enemy. When the city of Brielle was conquered by the Geuzen revolutionary army, the municipality of Haarlem started supporting the Geuzen. King Philip II of Spain was not pleased, and sent an army north under the command of Don Fadrique (Don Frederick in Dutch), son of Fernando Álvarez de Toledo, 3rd Duke of Alba. On 17 November 1572 all citizens of the city of Zutphen were killed by the Spanish army, and on 1 December the city of Naarden suffered the same fate. On 11 December 1572 the Spanish army put Haarlem under siege. The city's defenses were commanded by city-governor Wigbolt Ripperda. Kenau Simonsdochter Hasselaer, a very powerful woman, helped defend the city. During the first two months of the siege, the situation was in balance. The Spanish army was digging tunnels to reach the city walls and blow them up. The defenders dug tunnels to blow up the Spanish tunnels. The situation became worse for Haarlem on 29 March 1573. The Amsterdam army, faithful to the Spanish king, controlled Haarlemmermeer lake, effectively blocking Haarlem from the outside world. Hunger in the city grew, and the situation became so tense that on 27 May many (Spanish-loyal) prisoners were taken from the prison and murdered. Two city gates, the Kruispoort and the Janspoort collapsed during the fighting. In the beginning of July the Prince of Orange assembled an army of 5,000 soldiers near Leiden to free Haarlem. The Spanish trapped them at the Manpad and defeated the army. After seven months the city surrendered on 13 July 1573. Many soldiers of the army that defended the city were slaughtered; many of them were drowned in the Spaarne river. Governor Ripperda and his lieutenant were beheaded. The citizens were allowed to buy freedom for themselves and the city for 240,000 guilders and the city was required to host a Spanish garrison. Don Fadrique thanked God for his victory in the Sint-Bavo Church. Map of Haarlem after the fire in 1578 by Thomas Thomasz. The damage across the city can still be seen two years later. The city suffered a large fire in the night from 22 October to 23 October 1576. The fire started in brewery het Ankertje, near the weighhouse at the Spaarne, which was used by German mercenaries as a guarding place. When they were warming themselves at a fire it got out of control. The fire was spotted by farmers, who sailed their ships on the river. However, the soldiers turned down all help, saying that they would put out the fire themselves. This failed, and the fire destroyed almost 500 buildings, among them St-Gangolf's church and St-Elisabeth's hospital. Most of the mercenaries were later arrested, and one of them was hanged on the Grote Markt in front of a large audience. Maps from that era clearly show the damage done by the fire: a wide strip through the city was destroyed. The combined result of the siege and the fire was that about a third of the city was destroyed. The fire and the long siege had taken their toll on the city. The Spanish left in 1577 and under the Agreement of Veere, Protestants and Catholics were given equal rights, though in government the Protestants clearly had the upper hand and Catholic possessions once seized were never returned. To restore the economy and attract workers for the brewing and bleaching businesses (Haarlem was known for these, thanks to the clean water from the dunes), the Haarlem council decided to promote the pursuit of arts and history, showing tolerance for diversity among religious beliefs. This attracted a large influx of Flemish and French immigrants (Catholics and Hugenots alike) who were fleeing the Spanish occupation of their own cities. Expansion plans soon replaced plans of rebuilding the destroyed city walls. Just like the rest of the country, the Golden Age in the United Provinces had started. The new citizens had a lot of expertise in linen and silk manufacture and trading, and the city's population grew from 18,000 in 1573 to around 40,000 in 1622. At one point, in 1621, over 50% of the population was Flemish-born. Haarlem's linen became notable and the city flourished. Today an impression of some of those original textile tradesmen can be had from the Book of Trades document created by Jan Luyken and his son. In 1632 a tow canal between Haarlem and Amsterdam, the Haarlemmertrekvaart was opened, the first tow canal in the country. The empty areas in the city that were a result of the fire of 1576 were filled with new houses and buildings. Even outside the city wall buildings were constructed—in 1643 about 400 houses were counted outside the wall. Having buildings outside the city walls was not a desirable situation to the city administration. Not only because these buildings would be vulnerable in case of an attack on the city, but there was also less control over taxes and city regulations outside the walls. Therefore a major project was initiated in 1671: expanding the city northwards. Two new canals were dug, and a new defensive wall was constructed (the current Staten en Prinsenbolwerk). Two old city gates, the Janspoort and Kruispoort, were demolished. The idea that a city had to be square-shaped was abandoned. After the fall of Antwerp, many artists and craftsmen migrated to Haarlem and received commissions from the Haarlem council to decorate the city hall. The paintings commissioned were meant to show Haarlem's glorious history as well as Haarlem's glorious products. Haarlem's cultural life prospered, with painters like Frans Hals and Jacob van Ruisdael, the architect Lieven de Key and Jan Steen who made many paintings in Haarlem. The Haarlem councilmen became quite creative in their propaganda promoting their city. On the Grote Markt, the central market square, there's a statue of Laurens Janszoon Coster who is allegedly the inventor of the printing press. 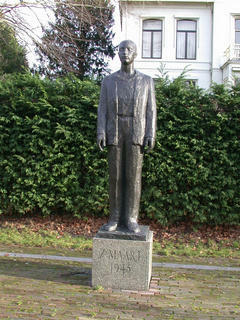 This is actually the second and larger statue to him on the square, the original stands behind the city hall in the little garden known as the Hortus (where today the Stedelijk Gymnasium school is located). Most scholars agree that the scarce evidence seems to point to Johann Gutenberg as the first European inventor of the printing press, but Haarlem children were taught about Lau as he is known, well into the 20th century. This legend served the printers of Haarlem well, however, and it is probably for that reason the most notable Dutch history books from the Dutch Golden Age period were published in Haarlem; by Hadrianus Junius (Batavia), Dirck Volkertszoon Coornhert (Works), Karel van Mander (Schilderboeck), Samuel Ampzing (Description and Ode to Haarlem), Petrus Scriverius (Batavia Illustrata), and Pieter Christiaenszoon Bor (Origin of the Dutch wars). Beer brewing was a very important industry in Haarlem. Until the 16th century the water for the beer was taken from the canals in the city. These were, through the Spaarne and the IJ, connected to seawater. However, the water in the canals was getting more and more polluted, and no longer suitable for brewing beer. A place 1.5 kilometers south-west of the city was then used to take fresh water in. However, the quality of that water was not good enough either. From the 17th century a canal (Santvaert) was used to transport water from the dunes to the city. The water was transported in barrels on ships. The location where the water was taken is called the Brouwerskolkje, and the canal to there still exists, and is now called the Brewers' Canal (Brouwersvaart). Haarlem was a major beer producer in the Netherlands. The majority of the beer it produced was consumed in Noord-Holland. During the Spanish siege there were about 50 brewing companies in the city; while 45 years later in 1620 the city numbered about one hundred breweries. There was another epidemic of the Black Death in 1657, which took a heavy toll in the 6 months it ravaged the city. From the end of the 17th century the economic situation in the city turned sour, for a long time. In 1752 there were only seven beer breweries left, and in 1820 no breweries were registered in the city anymore. In the 1990s the Stichting Haarlems Biergenootschap revived some of the old recipes under the new Jopen beer brand, that is marketed as a "Haarlem bier". In 2010 Jopen opened a brewery in a former church in central Haarlem called the Jopenkerk. From the 1630s until present day, Haarlem has been a major trading centre for tulips, and it was at the epicenter during tulip mania, when outrageous prices were paid for tulip bulbs. From the time that the Leiden-Haarlem canal Leidsevaart was opened in 1656, it became popular to travel from Rotterdam to Amsterdam by passenger boat rather than by coach. The canals were dug for passenger service only, and were comfortable though slow. The towpath led these passengers through the bulb fields south of Haarlem. Haarlem was an important stopover for passengers from the last half of the 17th century and through the 18th century until the building of the first rail tracks along the routes of former passenger canal systems. As Haarlem slowly expanded southwards, so did the bulb fields, and even today rail travelers between Rotterdam and Amsterdam will see beautifully blooming bulb fields on the stretch between Leiden and Haarlem in Spring. As the center of trade gravitated towards Amsterdam, Haarlem declined in the 18th century. The Golden age had created a large upper middle class of merchants and well-to-do small business owners. Taking advantage of the reliability of the trekschuit connection between Amsterdam and Haarlem, many people had a business address in Amsterdam and a weekend or summer home in Haarlem. Haarlem became more and more a bedroom community as the increasingly dense population of Amsterdam caused the canals to smell in the summer. Many well-to-do gentlemen moved their families to summer homes in the Spring and commuted between addresses. Popular places for summer homes were along the Spaarne in southern Haarlem. Pieter Teyler van der Hulst and Henry Hope built summer homes there, as well as many Amsterdam merchants and councilmen. Today, it is still possible to travel by boat along the Spaarne and this has turned into a popular form of tourism in the summer months. In the 18th century Haarlem became the seat of a suffragan diocese of the Old Catholic Church of Utrecht. At the end of the 18th century a number of anti-Orange commissions were founded. On 18 January 1795 the "Staatse" army was defeated near Woerden. During the night preceding the 19th, the same night that stadtholder William V of Orange fled the country, the various commissions gathered and implemented a revolution. The commissions changed the city's administrators in a bloodless revolution, and the next morning the city was 'liberated' of the tyranny of the House of Orange. The revolution was peaceful and the Orange-loyal people were not harmed. The Batavian Republic was then proclaimed. The French army entered the liberated city two days later, on the 20 January. An army of 1,500 soldiers was provided with food and clothing by the citizens. The new national government was strongly centralized, and the role and influence of the cities was reduced. The Batavian Republic had signed a mutual defense pact with France, and was thus automatically at war with England. The strong English presence at sea severely reduced the trading opportunities, and the Dutch economy suffered accordingly. The textile industry, which had always been an important pillar of Haarlem's economy, was in a bad shape at the beginning of the 19th century. Strong international competition, and revolutionary new production methods based on steam engines already in use in England, dealt a striking blow to Haarlem's industry. In 1815 the city's population was about 17,000 people, a large percentage of whom were poor. The foundation of the United Kingdom of the Netherlands in that year gave hope to many, who believed that under a new government the economy would pick up, and that export-oriented economic activities such as the textile industry would recover. In the beginning of the 19th century the defense walls had lost their function, and architect Zocher Jr. planned a park on the location of the former defense line. The city walls and gates were demolished and the bricks were reused for construction of workers homes and factories. Haarlem became the provincial capital of Noord-Holland province in the early 19th century. In the mid 19th century the city's economy slowly started to improve. New factories were opened, and a number of large industrial companies were founded in Haarlem by Thomas Wilson, Guillaume Jean Poelman, J.B.T. Prévinaire, J.J. Beijnes, Hendrik Figee, Gerardus Johannes Droste and G.P.J. Beccari. The Nederlandsche Handel-Maatschappij (NHM or Dutch Trade Company) was founded by King Willem I to create employment opportunities. As one of the cities in the western part of the Netherlands with the worst economical situation, three cotton mills were created in Haarlem under the NHM-program in the 1830s. These were run by experts from the Southern Netherlands, whom the NHM considered better at mechanical weaving through the local expertise of Lieven Bauwens. The lucky contract winners were Thomas Wilson, whose factory was situated north of what is today the Wilsonplein, Guillaume Jean Poelman, who was in business with his nephew Charles Vervaecke from Ghent and had a factory on what today is the Phoenixstraat, and Jean Baptiste Theodore Prévinaire, who had a factory on the Garenkokerskade and whose son Marie Prosper Theodore Prévinaire created the Haarlemsche Katoenmaatschappij in 1875. These cotton factories produced goods for export, and because the Dutch government levied heavy taxes on foreign cotton producers this was a profitable business for the NHM-factories, especially for export to the Dutch East Indies. The programme started in the 1830s, and was initially successful, but after 1839 when Belgium was split away from the United Kingdom of the Netherlands, the protectionist measures for the Dutch East Indian market were removed and the business began to flounder. When the American Civil War reduced the import of raw cotton significantly after 1863, the business went sour. Only Previnaire was able to survive through specialization with his "Turkish Red" dye. The Previnaire "toile Adrinople" was popular. Previnaire's son went on to create the Haarlemsche Katoenmaatschappij, which made a kind of imitation batik cloth called "La Javanaise" that became popular in Belgian Congo. In 1804 Richard Trevithick designed the first locomotive. The government of the Netherlands was relatively slow to catch up, even though the King feared competition from newly established Belgium if they would construct a train track between Antwerp and other cities. Dutch parliament balked at the high level of investment needed, but a group of private investors started the Hollandsche IJzeren Spoorweg-Maatschappij on 1 June 1836. It took three years to build the first track, between Haarlem and Amsterdam along the old tow canal called the Haarlemmertrekvaart. The ground there was wet and muddy. On 20 September 1839 the first train service in the Netherlands started. The train had a speed of about 40 kilometers per hour. The train service gave the Beijnes company, and indirectly the whole economy of Haarlem, a strong boost, and the effects of this can be seen in the Haarlem railway station, now a rijksmonument. Instead of more than 2 hours, Amsterdam was now only 30 minutes away. The old passenger service by trekschuit along the Haarlemmertrekvaart was quickly taken out of service in favor of the train service which was quicker and more reliable. In 1878 a Beijnes-made horse tram started servicing passengers from the railway station to the Haarlemmerhout woodland park, and in 1894 the Eerste Nederlandsche Electrische Tram Maatschappij (ENET) was founded with cars built by Beijnes and became the first Dutch electric tram, which ran in Haarlem from 1899 onwards. Though the old trekvaart is closed for water traffic today, thanks to these early rail developments, it is still possible to travel by boat from Amsterdam to Haarlem, via the ringvaart or the North Sea Canal. Pleasure boating in the summer has become an important Haarlem tourist attraction, though it is not possible to travel all of the old canals as in Amsterdam. The creation of new land in the Haarlemmermeer from 1852 onwards, meant that the city could no longer refresh the water in its canals using the Spaarne river. The increase in industry made the water quality even worse, and in 1859 the Oude Gracht, a city canal, stank so badly in the summer, that it was filled in to create a new street called the Gedempte Oude Gracht. From 1879 the population of the city almost doubled in thirty years, from 36,976 to 69,410 in 1909. Not only did the population grow, but the city was expanding rapidly too. The Leidsebuurt district was incorporated into Haarlem in the 1880s. A small part of (the now defunct) municipality of Schoten was incorporated in 1884 because the council of Haarlem wanted to have the hospital (Het Dolhuys) inside the municipal borders. This hospital was situated at "het bolwerk" on Schoten's territory. In the beginning of the 20th century the city expanded north. As early as 1905 an official plan was presented by the Haarlem municipality for expansion. However, the surrounding municipalities did not agree, and it would take 25 years to come to an agreement. On 1 May 1927 the municipality of Schoten became part of Haarlem, as well as part of Spaarndam, Bloemendaal and Heemstede. The population increased at once with 31,184 citizens. In 1908, a renewed railway station was opened. The station was elevated, so traffic in the city was no longer hampered by railway crossings. In 1911, Anthony Fokker showed his plane, de Spin to the audience in Haarlem by flying around the Sint-Bavokerk on Queen's Day. Later the expansion of the city went southwards (Schalkwijk) and eastwards (Waarderpolder). In 1932, Vroom & Dreesmann, a Dutch retailer built a department store at Verwulft. Many buildings were demolished, except one small chemist's shop on the corner, "Van der Pigge", who refused to be bought out and which is now encapsulated by the V&D building. During World War II, the Dutch heroine Hannie Schaft worked for a Dutch resistance group; she was captured by the Germans and executed just before the end of the war in 1945. Despite her efforts and those of her colleagues and private families such as the Ten Booms, most Haarlem Jews were deported, the Haarlem Synagogue was demolished and the Jewish hospital was annexed by the St. Elisabeth Gasthuis. Several Haarlem families, whether they were politically active in the NSB or not, suffered from random attacks, as the Haarlem writer Harry Mulisch described in his book De Aanslag. Haarlemmers survived during the Hunger Winter by eating tulip bulbs stored in sheds in the sandy fields around the city. From 17 September to 21 September 1944, parts of Haarlem-Noord (north of the Jan Gijzenvaart) were evacuated by the Germans to make place for a defensive line. The stadium of HFC Haarlem, the soccer club, was demolished. Hundreds of people had to leave their houses and were forced to stay with other citizens, who did not welcome them with open arms, since many were already starving. From 22 September to the end of the war, there was gas available only two hours per day. Electricity stopped on 9 October. The German occupiers built a thick, black wall through the Haarlemmerhout (in the south of the city), as well as at the Jan Gijzenvaart in the evacuated area. The wall was called Mauer-muur and was meant to help defend the city. In 1944 the family of Corrie ten Boom was arrested by the Nazis; they had been hiding Jews and Dutch resistance workers from the German occupier throughout the war. Haarlem never really recovered after the war. After the war much of the large industry moved out of the city, such as the banknote printing firm of Joh. Enschedé. The center of industry and shipping had definitely shifted towards Amsterdam. Though the population had been decimated from starvation, a new wave of immigrants came to the city from the former colonies in Indonesia. This brought some government funding for building projects. In 1963 a large number of houses was built in Schalkwijk. Haarlem has had a Christian parish church since the 9th century. This first church was a "daughter church" of Velsen, which itself was founded in 695 by St. Willibrord. It was a wooden church at the site of the current Grote Kerk on the Grote Markt (central market square). Haarlem was granted its first known indulgence by Clement V in 1309, during the Avignon Papacy. In 1345 Haarlem received city rights as a result of population growth and the church was expanded. Later, after the fires of 1347 and 1351, Haarlem was again granted a Portiuncula indulgence in 1397 for funding to rebuild the church. This indulgence would be used again and again over the centuries to fund expansion and restoration activities. 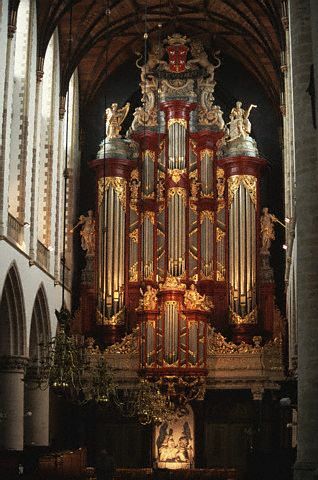 Having been granted papal rights from Avignon was perhaps the reason that the ties to Rome were never very strong in Haarlem, since the building most commonly called the Cathedral in the center of town only held a cathedra for 19 years, from 1559 to 1578. This Grote Kerk or Sint-Bavokerk was originally a parish church devoted to Maria, but was later named after the patron saint of Haarlem, Saint Bavo, who descended from Heaven regularly to free the Haarlemmers from invaders, most recently when the Kennemers and West-Friesians attacked in 1274. This is allegedly how the Haarlem war cry "Sint Bavo voor Haarlem" originated, which was used during the siege against the Spaniards in 1572 that eventually resulted in an underground cathedra called the Sint Josephstatie, on the Goudsmitsplein. Officially, the church in the center of town is called the Grote Kerk, since it is Dutch Reformed and they do not believe in patron saints. Nearly everyone in Haarlem refers to it as the Sint Bavo, however. This makes it quite confusing for tourists, because Haarlem also has another Cathedral of Saint Bavo, situated on the Leidsevaart. This duality began with the Reformation troubles of 1566. The Roman Catholic parish of Haarlem became a Diocese in 1559 (Dioecesis Harlemensis) and the first bishop of Haarlem was Nicolaas van Nieuwland (born in 1510). He accepted the position on 6 November 1561. In 1569 he was advised to resign by the Duke of Alva, because of his reputation for drinking (Dronken Klaasje). He had a good reason to drown his sorrows, because he feared the Catholic Spanish invaders as much as the native Dutch reformers. The Grote Kerk was initially spared from iconoclasm, because the city's mayor ordered the closing of the church for several months in 1566. That gave the various groups in Haarlem the time to quietly remove many of the treasures from the church and stash them safely in underground chapels. All symbols and statues linked to the Roman Catholic faith were removed from the cathedral. Since many groups already had their own chapels in the Grote Kerk, this was conducted in an orderly way. However, after the siege of Haarlem was lost, the Spanish army restored Roman Catholic iconography. The guilds had to restore their old altars, at great expense. Since Haarlem was quite poor after the siege, this led to many of the chapels and other Catholic churches being abandoned and used for other purposes. The Bakenesserkerk, where 1500 soldiers were held before being killed by the Spanish after their victory, was used to store turf for fifty years. Van Nieuwland was succeeded by Godfried van Mierlo, who would be the last bishop in communion with Rome Haarlem would know for 300 years. In 1578 after the Spanish were defeated, the church was attacked on Sacrament day (29 May), this time by soldiers of the Prince of Orange. One of the priests was killed, and many objects in the church were destroyed. This event, called the Haarlemse Noon, forced the bishop to flee the city. Fortunately, many treasures were still safe 500 yards away in the underground Catholic church. The city council confiscated the Sint Bavo Kerk and all of its daughter churches, and later converted them along the tenants of the Evangelical Reformed Church. The new (and current) name became Grote Kerk. Old Catholics and the Lutherans, though officially tolerated, went underground. Both Protestants and Catholics alike felt that when all political unrest had subsided, the Catholics could regain control of "their" church. However, the Dutch Protestants had also removed all Catholics from local government and feared that they would have to pay damages to the Catholics if they were allowed their own churches again. All over the Netherlands, new Catholic churches were subsidized, called Waterboard churches, for their similarity to Waterboard pump stations (they were designed by the same architect in Neo-classical style), and in Haarlem they built the St. Joseph kerk in the Jansstraat in 1841. It was not until 1853 that a new Roman Catholic bishop was installed in the St. Joseph kerk. As this church grew, a new cathedral, again called the Cathedral of Saint Bavo, was built at the Leidsevaart (canal to Leiden) in 1898. The Bishop of Haarlem has a formal residence on the Nieuwe Gracht canal. There is also an Old Catholic bishop of Haarlem. The Frans Hals Museum, which was the Haarlem municipal museum, has still in its collection today many pieces confiscated from the churches during the Haarlemse Noon. There are several museums in Haarlem. The Teylers Museum lies on the Spaarne river and is the oldest museum of the Netherlands. Its main subjects are art, science and natural history, and it owns a number of works by Michelangelo and Rembrandt. Another museum is the Frans Hals Museum of fine arts, with its main location housing Dutch master paintings, and its exhibition halls on the Grote Markt housing a gallery for modern art called De Hallen. Also on the Grote Markt, in the cellar of the Vleeshal is the Archeologisch Museum Haarlem, while across the square on Saturdays, the Hoofdwacht building is open with exhibitions on Haarlem history. Other museums are Het Dolhuys (a museum of psychiatry), the Ten Boom Museum (a hiding place for Jews in World War II) and the Historisch Museum Haarlem, across from the Frans Hals Museum. The city contains several theatres, cinemas and other cultural attractions (apart from the museums). The Philharmonie is a concert hall in the centre of the city near the Grote Markt. Next to it is the Toneelschuur theatre, which also has some movie theatres (often referred to as the Filmschuur). The Stadsschouwburg on the Wilsonsplein reopened in 2008 after a major renovation and can seat 698. The Patronaat is a pop music hall, one of the largest in the Netherlands of its kind. It is a popular night spot among many of the city's residents and others. Every year in April the bloemencorso (flower parade) takes place. Floats decorated with flowers drive from Noordwijk to Haarlem, where they are exhibited for one day. In the same month there is also a funfair organized on the Grote Markt and the Zaanenlaan in Haarlem-Noord. Bevrijdingspop is a music festival to celebrate the Dutch liberation from the Nazis after World War II. It is held every year on 5 May, the day that the Netherlands were liberated in 1945, at the Haarlemmerhout. At the same location, the Haarlemmerhoutfestival is also held every year, which is a music and theatre festival. Other yearly events on the Grote Markt are "Haarlem Jazzstad" (a jazz festival), "Haarlem Culinair" (a culinary event) and the "Haarlemse Stripdagen" (Haarlem comic days). Haarlem is home to many different sport clubs practicing a great diversity of sports. There are several amateur association football clubs. Haarlem also had a professional football club, HFC Haarlem, which went bankrupt in January 2010. Another Haarlem based football club still in existence is Koninklijke HFC (Royal Haarlemsche Football Club). It was founded by Pim Mulier in 1879 as the first football club in the Netherlands, making it the oldest club in Dutch history. Tennis club HLTC Haarlem, founded in 1884, and judo association Kenamju, founded in 1948, are also the oldest Dutch clubs in their sports. Haarlem is known for hosting several international sports tournaments as well: the Haarlemse Honkbalweek (Haarlem Baseball Week), a baseball event held every two years at the Pim Mulier Stadium (named after Pim Mulier), and the Haarlem Basketball Classic, a basketball event. The first international bandy match was played between Haarlem and Bury Fen Bandy Club. Folk singer Al Stewart mentions Haarlem in his song "Amsterdam". The train station of Haarlem was part of a set during the movie Ocean's Twelve. The book Confessions of an Ugly Stepsister by Gregory Maguire is set in Haarlem. The book The Black Tulip by Alexandre Dumas, père has several scenes in Haarlem, most notably the ending, and it is the Horticultural Society of Haarlem that offers a reward for a black tulip. In 1628 a chemist in Haarlem goes broke, and decides to join the VOC to sail to the East. His name, Jeronimus Cornelisz, will always be connected with the Batavia ship. Since the 18th century, Haarlem has historically had more museums per inhabitant than any other city of the Netherlands. It also has the highest number of defunct museums per inhabitant. The city is notable for its many hofjes: almshouses built around courtyards. These were mainly privately funded houses for elderly single women. Nowadays there are 19 hofjes in Haarlem; many open to the public on weekdays. Many hofjes are still owned by the original foundations, and are still mainly used for single elderly women. Haarlem is served by two railway stations of the Nederlandse Spoorwegen (Dutch Railways). From Haarlem railway station there are 6 trains an hour to Amsterdam, with a journey time of 15 to 20 minutes, 6 trains an hour to Leiden and The Hague (two stations), and 2 trains an hour to Zandvoort aan Zee. On the east of Haarlem, there is Haarlem Spaarnwoude, which has 2 trains per hour to Amsterdam. The city is also served by several bus lines of Connexxion. These buses traverse a large region around Haarlem, including Amsterdam. There is a special bus rapid transit too, called the Zuidtangent which is operated by Connexxion. This bus goes from Haarlem to Amsterdam via Schiphol Airport. The police services in Haarlem are provided by the Kennemerland police corps. The city of Haarlem also employs uniformed municipal enforcement officers, their duties consist of parking, sanitation, traffic, permit enforcement, and patrols throughout the city. Beer brewing has been a very important industry for Haarlem. The heyday of beer brewing in Haarlem goes back to the 15th century, when there were no fewer than 100 breweries in the city. When the town's 750th anniversary was celebrated in 1995 a group of enthusiasts re-created an original Haarlem beer and brewed it again. The beer is called Jopenbier, or Jopen for short, named after an old type of beer-barrel. Jopen Koyt and Jopen Adriaan are based on old recipes from 1402 and 1407 respectively. Jopen Adriaan is named after the windmill that re-opened in 2002. Jopenbier also features a bock beer and a light beer ("spring beer"). Jopenbier is now generally available again, mainly in the Haarlem area. Initially the beers were brewed at brewery De Halve Maan in Hulst but now they are brewed at De Koningshoeven, the brewery of La Trappe, in Tilburg. A local chess-club is called "De Haarlemse Jopen". In 1658, Peter Stuyvesant, the Director-General of the Dutch colony of Nieuw Nederland (New Netherland), founded the settlement of Nieuw Haarlem in the northern part of Manhattan Island as an outpost of Nieuw Amsterdam (New Amsterdam) at the southern tip of the island. After the English capture of New Netherland in 1664, the new English colonial administration renamed both the colony and its principal city "New York," but left the name of Haarlem more or less unchanged. The spelling changed to Harlem in keeping with contemporary English usage, and the district grew (as part of the borough of Manhattan) into the vibrant center of African American culture in New York City and the United States generally by the 20th century. ^ a b c "Area (Kerncijfers wijken en buurten 2004-2010)". CBS. http://statline.cbs.nl/StatWeb/publication/?VW=T&DM=SLNL&PA=70904ned&D1=163-165&D2=6777&D3=l&HDR=T&STB=G1,G2. Retrieved 2012-03-15. "Population (Bevolkingsontwikkeling; regio per maand)". CBS. http://statline.cbs.nl/StatWeb/publication/?VW=T&DM=SLNL&PA=37230ned&D1=0-8,13,15,17&D2=67,89,269&D3=129&HDR=T&STB=G2,G1. Retrieved 2012-03-15. ^ "Collections". Teylers Museum. http://www.teylersmuseum.eu/index.php?item=64&flact=1&lang=en. Retrieved 2010-05-05. ^ "Information". Ten Boom Museum. http://www.corrietenboom.com/information.htm. Retrieved 2010-05-05. This page uses content from the English language Wikipedia. The original content was at Haarlem. The list of authors can be seen in the page history. As with this Familypedia wiki, the content of Wikipedia is available under the Creative Commons License.